The Best Little Cat House was featured in L.A. Magazine and Cat Fancy! CLICK HERE TO SEE! The Best Little Cat House specializes in luxury cat only boarding and grooming. Each of our three locations are unique and offer our feline guests the very best accommodations available in a relaxed and friendly environment. Let our caring staff of Cat Concierges pamper your cat while you're away. We offer Cage Free Group Boarding as well as Private Accommodations for special needs kitties and cats whose owners do not want their cats to interact with other cats. We don't board sick animals or dogs so you know that your cat won't be exposed to any undue stress or illnesses. All of our rooms have controllable web cameras so you can see your kitty from wherever you are. Please consider a tour of our facility to see why we are The Best Little Cat House. 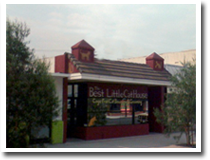 The Best Little Cat House in Burbank is conveniently located a half mile from the entrance to Bob Hope Airport in Burbank, CA and half way between the 5 freeway and the CA134. Each room is themed after a different country so your cat can have a vacation too! 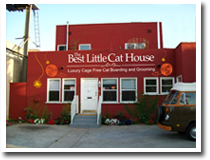 The Best Little Cat House in Los Angeles is located at 3rd and La Brea close to The Beverly Center and The Grove. It has three sunny Group Rooms and one large Private Room. 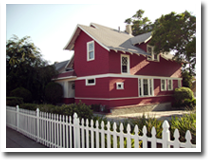 Our Pasadena establishment is located in a climate controlled turn-of-the-century Victorian with up-to-date amenities for the ultimate in cat boarding. We are just minutes from downtown Pasadena and close to the 134, 110, 210 and 5 Freeways. The Best Little Cat House offers professional cat only grooming in a relaxed atmosphere designed to minimize stress. At The Best Little Cat House, cats can get a special "Shed Control" service to remove the loose hair that ends up all over the furniture, or worse, as a hairball on the carpet! We offer 2 basic clips, the Lion Cut or Kitten Clip, which help to minimize shedding and hair balls and keep kitties cool in the summer. A complimentary manicure and pedicure is included with all of our spa services. We also offer acrylic nails caps, better known as "Soft Paws," as a humane alternative to de-clawing. Please choose the location nearest to you and select the Grooming page for details and pricing. No cats looking for homes.